Let me try again. There’s this new cutting-edge band, they aren’t very big but they use cutting-edge technology (which is appropriate, because one of the motifs they use is technology!!!! 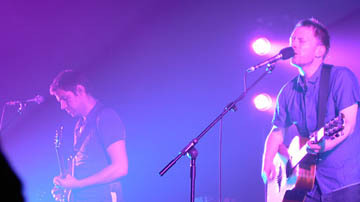 ), and they’ve decided to release their new songpile In Rainbows as a zip file of 10 mp3s. Let me start again: Radiohead is the biggest band in the world and Pitchfork is like 1968 Rolling Stone but without all the naked dudes (unless you count those EXTREMELY NSFW pictures of Kevin Barnes they posted a while back). Radiohead has sold, like, a gajillion albums. Like, enough albums that you could invent a new metal above multi-platinum to give them (How about giga-platinum?). Releasing In Rainbows on a museum-style, pay-what-you-wish scale is fine – they don’t need your money, and if they want $10 million all they have to do is book five stadium concerts. Understand, here, they have nothing to lose. With that in mind, what do we make of this hubbub about Radiohead revolutionizing the way music is distributed? Will In Rainbows revolutionize the record industry? Will people start to think of recorded music as worthless? How will bands subsidize themselves without record sales? First, let’s clear up some faulty logic. People have been taking this “now the record industry is fucked” idea a little too far. Is the record industry fucked? Well, yes, but not because of Radiohead. It was fucked the moment the RIAA decided it was a good idea to ignore a budding new medium for music (MP3) and instead to start filing lawsuits against its own potential customers. Oh, and to make CDs that will break your computer if you try to rip them. And don’t forget all those new download services where you don’t really own the music you download. Hey, Napster, I remember y– why are your eyes glazed over like that? We should look at In Rainbows on more realistic terms: Radiohead’s contract ran up and they decided it would be fun to forgo releasing on a label. It’s a brilliant move for Radiohead; since 2003’s Hail to the Thief, which is as close as we’ve come so far to Radiohead: The Musical, they’ve been sliding into that comfortable zone with R.E.M. and U2 where everyone will love you forever, even though you’re kind of culturally irrelevant (fewer and fewer Radiohead knock-off bands these days) but HEY REMEMBER WHEN YOU MADE OK Computer!?!?! Certainly Radiohead has given us something to think about, and history may remember the album as the CD format’s eulogy. But they won’t be remembered as the catalyst. Already bands’ songpiles get streamed in full through Web sites, they come to you on flash drives, they get burned onto CD-R’s by the bands themselves and shipped to you through Amplifier. Already record labels’ established bands can’t pull in enough money for those labels to sign moneypit unknowns. I admire these kinds of efforts from lesser-known bands, since you know they’re operating at a loss; they have everything to lose. We can talk optimistically about the new model or digital futurezzz or, like, MP9’s or whatever comes next. But the only way this whole Radiohead thing is going to make a difference is if some bands who actually have something to lose start to make statements that bold. In Rainbows is a fine album, sure, but it’s no OK Computer or Kid A or even The Bends, and not just because it’s Radiohead Does Coldplay – really, it’s a good album, beautiful at times (tell me “15 Step” and “Reckoner” don’t give you the chills) but it’s not terribly interesting. This is the safest Radiohead’s sounded since that crunching guitar punctured “Creep.” I say this not to equivocate “boring” or “safe” music with irrelevance. 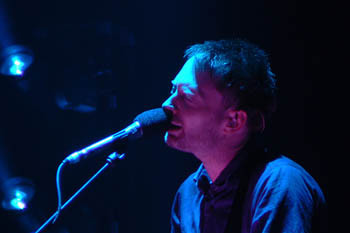 But the fact that Radiohead can make this songpile and “sell” over a million preorders in 10 days indicates to me that they can afford to take risks – like, say, releasing an album’s worth of songs for, eh, however many pounds you want to shell out – which will mean, at worst, that Thom Yorke might miss a week’s worth of gold-dusted blueberries on his flan. The problem, really, is that Radiohead’s cultural moment is over, so we can’t expect the band’s sales model to affect the industry more than its music will. When Capitol Records’ entire roster jumps ship, or when Merge Records decides it wants to release nothing but 78rpm LPs and MP3 songpiles, then I’ll listen. Full disclosure: When I linked to the free, full-album stream of Fishboy’s Albatross, I was plugging the upcoming release of my own band. Actually I still am. Right now. i LOVE in rainbows. i would actually have to say that it’s their best album yet. I didn’t bother to see who wrote this but as I got near the end I kept thinking, ‘where is all this sarcasm coming from?’. And bam, it’s you. Very funny and well done. I completely agree with everything you say about Radiohead and the music industry.